Abe Cohen Plumbing and Heating Inc. is who you need to call for residential garburators (waste disposers, in-sink-erators) in Ahuntsic, Baie D'Urfe, Beaconsfield, Bord du Lac, Cote Saint-Luc, Cote St-Luc, Dollard des Ormeaux, Dorval, Downtown, Hampstead, Ile Bizard, Lachine, Lacey Green, Lakeshore, LaSalle, Laval, Mile End, Montreal West, NDG, Nouveaux St. Laurent, Nun's Island, Old Montreal, Outremont, Pierrefonds, Plateau, Pointe Claire, Pointe St. Charles, Roxboro, Ste-Genevieve, St. Henri, Town of Mount Royal, Verdun, Ville St. Laurent, West Island, Westpark, Westmount. We can help you to understand the differences between the types of in-sink waste disposers that are available, which ones are feasible for installation in your home, and which units are most appropriate. We have all the tools and skills required to promptly supply and install the garburator that best suits your needs. 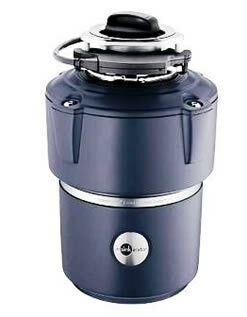 Your in-sink food waste disposer may be covered under warranty. These units are often warranted for many years. Call us or refer to the paperwork that came with your unit. Beyond the warranty period, simple repairs are possible. A serious problem almost always indicates that replacement with a new unit is the best solution. Never put your hand into the waste disposer. Avoid disposing of hard objects in the waste disposer, such as plastic, glass, seafood shells, metal, bones, gristle, and rubber, unless the product manual specifically states that the object or material is acceptable in the unit you have installed. Avoid putting fibrous (stringy) materials (such as wood, corn husks, artichokes) into the waste disposer. To remove inappropriate materials from the waste disposer, use pliers or tongs. Never put your hand into the waste disposer. Avoid using chemical drain cleaners in the waste disposer. While operating the disposer, run a strong flow of cold water to keep the ground waste moving through the system and to keep grease hard (to prevent it from clogging the disposer or the drain pipes). After grinding all waste, allow the water to run for an additional minute. At Abe Cohen Plumbing and Heating Inc, we are a three-generation family business with more than 50 years in the plumbing trade. We consider our customers to be family and friends in a long-term relationship with us. We have the experience, expertise, tools, and equipment to install and repair all types of residential in-sink waste disposal units in the greater Montreal area. We are respectful, clean, and professional. We are certified and active members of CMMTQ (Corporation des maîtres mécaniciens en tuyauterie du Québec), ACQ (Association de la Construction du Québec), and certified partners of Gaz Métro for natural gas piping and installations.